Wright brothers - Wikipedia - The two fraudsters from Dayton, Ohio. "it would relieve me of the charge of having made a big fuss about something that had not after all panned out to amount to anything" (Amos Ives Root, "Letter to the Wright brothers", November 9, 1905). A. I. Root was a businessman from Medina, Ohio, USA, who had a passion for science and technology, at the same time being a religious man and Sunday School (Christian educational institution) teacher. Why is him important for the hoax perpetrated by the Wright brothers regarding spectacular powered flights allegedly performed by them between December 17, 1903, and October 5, 1905, before the first officially witnessed take offs made by others in 1906? Because A. I. Root, out of pure enthusiasm for airships without gas bags combined with the effort to sell his journal "Gleanings in Bee Culture", published, in its January 1st, 1905, issue, a story that, in some respects, out-rivalled the Arabian Nights fables, as himself stated. The main idea of Root's tale is that he witnessed Wilbur Wright completing a circuit through the air, near Dayton, on September 20, 1904. However, did this entrepreneur from Medina really see, that day, a plane flying some distance and returning to the starting point? The goal of the columns which follow is to prove that he just fabricated a narration based mainly on some ground tests he had witnessed, detailed explanations received from the two brothers themselves and at least one picture showing Wilbur gliding with his 1902 apparatus. Fortunately, the numerous letters sent by Root to Dayton and all articles or paragraphs of interest written by him in Gleanings are available in archives and all have been converted to electronic format by me directly from the scanned originals to be sure no detail is missed. To avoid accusations that I give citations out of context to make a point, these texts are attached in full to the present work and ordered chronologically. You do not have to read all of them. Only a few contain information of real interest for proving that Root did not, in fact, witness any powered Wright machine flying before August 29, 1910, a date well within the aviation age. Despite pretending repeatedly in Gleanings he saw Wilbur flying on September 20, 1904, this man from Medina left behind faint traces, either in his letters or articles, that show he did not and in consequence his value as a reliable witness is zero. - Section I explains who A. I. Root was and examines, in chronological order, his most important letters to the Wrights and articles he wrote in connection with the two inventors. - Section II, titled "Questions and Answers", that ends with a series of conclusions, is the most important division of this work because it presents in a concise manner, and based on relevant excerpts from the documents he left behind, what Root saw and did not see during the visits he paid to the Wright brothers. - Section III is simply a more detailed version of part I. It contains extensive quotations from A. I. Root's letters and articles. A multitude of fragments, from various articles of the time and other letters and documents, are included in order for the reader to have a much clear picture of the general context in which A. I. Root wrote his texts. - Section IV and V contain Root's letters and articles, in full, plus a few other related documents. In short, Amos Ives Root, 64 years old, a personage the Wright brothers had never heard about, and who had read about the December 17, 1903, flights, sent them a letter on February 16, 1904, expressing his wish to witness some of their next experiments. The two inventors answered on February 23, 1904, suggesting he might have such an opportunity. Root became insistent and bothered them with a few more requests. Finally, from his August 23, 1904, letter we find out he had already visited the Wrights but the text does not confirm he had seen a plane flying. The visit took place after July 26, 1904. A text dated September 12, 1904, the first after that of August 23, shows evidence he had received a new invitation from Dayton. The next letter, written on September 22, 1904, is quite puzzling because it does not suggest Root had seen a powered flight two days before or during the summer of that year. Sometime between the 22nd and 26th of September 1904, the insistent entrepreneur and aviation enthusiast sent another letter together with an early draft (missing from the archive) of the article that would finally appear in Gleanings in its January 1, 1905, number. Only the letter is available and, unfortunately, it does not make reference to any flight Root had witnessed up to that date. The answer sent by the Wrights, on September 26, 1904, was not the one Amos Root would have liked to get. He continued to push ahead for three more months with his arguments trying to convince the two inventors the article would be in their favour. While negotiating the publication of another story, that would appear in Gleanings for October 15, 1904, Root wrote to Wilbur, on October 8, 1904, these lines: "I have repeatedly already explained to my friends that I was not at liberty to mention what I witnessed and they have always taken it kindly" which throw doubts regarding his credibility in front of the people who knew him. As a note, what precisely he witnessed is not clearly stated. Without explicitly saying when, he visited again the two inventors during November 1904, as he had promised in a letter composed on the 7th of the same month. As a parenthesis, Wilbur wrote in his 1904-1905 notebook, on page 36, that five trials were made on November 22, 1904, and the flights ranged from 150 to 250 feet. A. I. Root is mentioned as one of the people who were present. It is known with certitude that the day of November 28, 1904, found the old beekeeper writing a message to extend his congratulations to his good friend Orville for the good flight he made just as Root left for his car, a formulation suggesting the old aviation enthusiast was no longer present when the younger brother performed that satisfactory travel through the air. He received the information by some other means than from directly seeing the flight with his own eyes. On the other hand, the next lines of the same letter seem to confirm that Amos Root once witnessed Orville striking the ground with his plane and then flying and managing the machine as gracefully as anything Root had ever seen in the line. The next letter, dated December 6, 1904, is even more stunning. First, the old Amos expressed his satisfaction that Orville had gone around four times without stopping on Dec. 1st. He obtained the information from Torrence Baird (Beard), a man he had asked to keep him updated, about the flights of the two inventors, with messages written on postal cards. Then he wrote: "if Orville sailed that thing as gracefully and steadily as he did on the last trip I witnessed he certainly is not a back number to any man living at present" which means Root had really witnessed Orville flying. It is hard to find a different explanation for such a phrase that appears in a letter addressed to the Wright brothers themselves, not in a text meant for publication where fiction can play an important role, unless the old Amos had moments when he lost touch with reality and his mind constructed visual images based on what Torrence, a false witness instructed by the brothers to tell lies, mailed him. A search for the name "Beard" within the content of the current work will reveal more details about the involvement of the Beard family members in the Wright affair, as doubtful witnesses. As a remark, the January 1, 1905, article does not make reference to any flight performed by Orville and having Root as an onlooker despite the fact the text was updated mentioning the day of December 1, 1904, as the last of the season when the Wrights flew their plane. After being delayed so much, the article first submitted to the Wrights in September 1904 finally got into Gleanings with some revisions. The text is a mixture of personal assessments and conclusions, divagations, things Root had found out from various publications and the two inventors themselves and some paragraphs that describe what this businessman from Medina claimed he had seen with his own eyes. Amos Root states with clarity he personally met the Wrights: "I found them in a pasture lot of 87 acres, a little over half a mile long and nearly as broad" and then continues: "When I first saw the apparatus it persisted in going up and down like the waves of the sea.". The article does not say when Root first saw the machine but from his August 23, 1904, letter it results the event happened before that date without being quite clear what exactly he had witnessed. a locomotive made of aluminum. Well, now, imagine this white locomotive, with wings that spread 20 feet each way, coming right toward you with a tremendous flap of its propellers, and you will have something like what I saw. The younger brother bade me move to one side for fear it might come down suddenly; but I tell you, friends, the sensation that one feels in such a crisis is something hard to describe. Also, at one point somewhere in the article, Root mentions he saw the machine lifting that weight added for stabilisation purposes: "When I saw it pick up the fifty pounds of iron so readily I asked if I might ride in place of the iron. I received, by way of assurance, the answer that the machine would no doubt carry me easily.". As a note, it has to be stressed that the January 1, 1905, article was submitted to the Wrights on December 24, 1904, for a final approval. A copy of this last draft still exists in archives. So, the text was not published without the consent of the two inventors. In the same issue of Gleanings (January 1, 1905), Root published another article which, unlike the first, has the quite explicit title "My Flying-Machine Story". He again refers to the experiments he witnessed using what can be labelled as a poetic style: "I enjoyed being out in that big field with the Wright brothers many times during the past summer and fall, watching that wonderful creation of the hand and brain of those two men, while it "learned to fly," very much as a young bird just out of the nest learns by practice to use its wings.". However, soon Root comes back to reality ending his short essay with this dishonest promise: "A picture of the flying-machine up in the air will appear in our next issue, nothing preventing", which discredits him. He evidently told a lie. The old Amos was well aware on December 26, 1904, the day he wrote the text, that the January 15, 1904, number of Gleanings would show only a photo of a Wright glider (see the letter dated December 24, 1904). This was a trick played by Root to make the readers curious and sell his journal. Root's January 15, 1905, article titled "The Wright Brothers' Flying-Machine" starts with a disappointing "I shall have to apologize a little, friends, for giving a picture of the gliding-machine instead of a flying-machine" which is nothing else but a fraudulent excuse. A direct piece of evidence proving he really mislead his readers is the letter dated January 8, 1906, and sent to him by the American photographer George Grantham Bain who asked for that photography to enrich his collection. Bain wanted the picture promised by Root and not printed in the January 15, 1905, issue of Gleanings. Bain explicitly states in his letter he already had the photo of the gliding machine. It appears that the impressive photo of the glider in the air triggered in Root's mind the fantastic story he narrated in his January 1, 1905, long article. It is worth mentioning now a letter, of a certain G. L. Tinker, dated January 11, 1905, and published in Gleanings. If authentic, it represents evidence that the January 1, 1905, article of A. I. Root captivated the attention of at least one reader as long as this person stated: "It was with intense interest that I read in Gleanings for Jan. 1 the first notice of a practical flying-machine that has ever been published." The letters sent by the old Amos continued to arrive in Dayton, at the same high rate as in 1904, for two more years, 1905 and 1906, after which their frequency decreased substantially. Most of them are of little to no value containing in essence just the repetitive message that Wrights' friend from Medina was anxious to see new experiments. Unfortunately, despite his insistence pushed to the extreme he would not have the chance to see a Wright plane flying till August 29, 1910.
and that the machine has been brought back at the end of every trial to the starting place", followed a few lines further by a request for permission to publish at least a brief statement regarding what had been done. He was embarrassed because, and here are his own words: " they keep saying to me tauntingly "What has become of the Wright Bros?" " which is an affirmation that proves people who knew Root did not take his word for granted as he did with the word of the Wright brothers. The next three letters (of October 27, November 4 and 6, 1905) demonstrate the old Amos was relatively optimistic regarding his chance to witness a (new) flight. Following a letter dated October 26, 1905, and coming from the Wrights, Root immediately answered the next day asking the two inventors to send him a telegram just before a new flight attempt and emotionally declared that he would almost cross the ocean just to see that machine get outside of the enclosure. About a week later, on November 4, 1905, without making all the necessary verifications, Root suggested to his younger friends to send a telegram at such a time as to arrive in Medina between 5 and 6 in the morning which would allow him to take a train and reach the place where the Wrights performed experiments, at around one o'clock in the afternoon. Two days later, on November 6, 1905, after finding out the telegraph office opened at 7 o'clock AM, he came with a new proposal telling the two inventors to contact him by long distance telephone. One more letter followed (November 8, 1905) where Root notified his friends from Dayton about a difficulty with flying machines they and him had not thought of. The old Amos' high hopes were to be smashed by a Wrights' letter dated November 8, 1905. His answer, written the following day, November 9, 1905, shows his visible disappointment. He was not to witness a flight any time soon and asked for one more favour, the permission to publish a short note reading: "At present I am not at liberty to give a report of what the Wright Bros. have done during the past summer." This text itself contains nothing special. However, referring to the note, Root continued with a quite baffling explanation, and here are his own words: "it would relieve me of the charge of having made a big fuss about something that had not after all panned out to amount to anything.". Had he really seen one of the brothers flying in a circuit on September 20, 1904, he would not have made such a remark. Did that flight amount to nothing for him?! It is illogical. This is a strong piece of evidence A. I. Root had not seen any powered flight up to November 9, 1905. In Gleanings for November 15, 1905, Amos Root informed his readers he could not give details about the wonderful progress made by the Wright Brothers. In the meantime he received more powers from his friends in Dayton, as can be seen from his November 28, 1905, letter where he answered: "Many thanks dear friends for the permission to talk about flying machines", at the same time assuring the two inventors he would not cross red lines like divulging secrets about the construction of the machine and the method of starting. In the next number of his periodical (December 1, 1905) Root published a text which is quite close to the standard of the Scientific American. The complicated style with divagations that plagued the January 1, 1905, essay is gone and together with it the sensation that the entire account is just a piece of fiction is no longer felt by the reader. However, this last article, despite containing figures and technical explanations, is neither an eyewitness account, being based on letters received by Root from the two inventors, nor an exclusive text that only Gleanings had the privilege to make public. An ample investigation containing about the same things appeared in the French aeronautic journal L'Aérophile ("Les Frères Wright et leur Aéroplane à moteur", L'Aérophile, December 1905, pp. 265-272) where two Wrights' letters, containing precise details regarding the alleged September - October 1905 long flights, were printed. The first, dated October 9, 1905, was addressed to Captain Ferber, a French aeronaut, and the second, sent on November 17, 1905, to Georges Besançon, the founder of the journal. 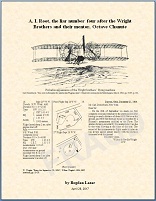 (3) "Chanute on the Wright Brothers' Achievement in Aerial Navigation" (col. 1, p. 307, April 14, 1906) authored by Octave Chanute, the mentor of the two inventors, himself. Another succession of little value texts followed. They contain mainly the same annoying idea that Root was anxious to see his friends doing experiments outdoors. Starting with his letter dated October 24, 1906, the old Amos put more and more pressure on the two Daytonians to allow him to publish something in Gleanings about their progress, invoking the existence of a lot of inquiries in regard to the airship. Having received no first hand information up to date of what the Wrights had been doing during the 1906 season, he could not hide his disappointment as can be seen from the following quite tough remark: "to tell the truth, as it is coming so near winter again I was getting a little discouraged, that is, so far as I have a right to be discouraged about something that is not my own affair". However, Root had an indirect source of news, more precisely an article, forwarded to him by his sister in Xenia, which quoted Octave Chanute as saying that the Wright brothers' airship was capable of a sustained flight with two people on board and 200 pounds of extra weight. With their permission, he would have liked to republish in his journal what O. Chanute had said. "So convinced am I that M. Santos-Dumont is on the right lines that I think it absolutely essential that the Wright brothers immediately make public the result of their experiments. Within six months their instrument will have been surpassed in France, and they will find they are too late." Root ended his October 29, 1906, text by explaining he was in a big dilemma, he would have liked to tell his readers about what Santos Dumont had just accomplished but at the same time he was afraid, at least this was his claim, that a lot of inquiries would follow relative to what the Wright Bros. had been doing during the previous 12 months. A very full and complete letter, dated October 30, 1906, and coming from Dayton, got Root out of his deadlock. It can be inferred from the answer promptly formulated the next day, October 31, 1906, that the brothers told him the statement of Octave Chanute (see the October 24, 1906, letter) was inexact or simply an invention of the papers. Root was also informed the text in the Automobile (October 25, 1906) was inaccurate. As an explanation, on October 23, 1906, Santos-Dumont really won an aviation prize, for being the first to fly more than 25 meters, but not the big $10,000 (1906 dollars) reward for completing a circular one-kilometer course in a heavier-than-air craft, as claimed by the Automobile. This appreciable sum of money was won later, on January 13, 1908, by Henry Farman. The last lines of the October 31, 1906, answer and the entire November 7, 1906, letter prepared the Wrights for a new visit. Root announced them he would be in Dayton on Wednesday, November 14, 1906, for a few hours before taking a train to St. Louise. Whether he met them is not clear from the available documents. However, it is certain that the two inventors, exasperated by Root's bombardment with letters, sent him a message for Gleanings that appeared in its November 15, 1906, issue. It is self-evident from the introduction: "Dear Mr. Root:  If your readers are really anxious to know what we have been working at this year we have no objection to your telling them." that the Wrights doubted Root's readers were so eager to learn details about their progress. The real person anxious to get news from them was Amos Root himself not the ones who bought his journal. The brothers continued their message with this explanation: "We have been engaged in designing and building machines suitable for actual service rather than mere experimenting, and have given special attention to perfecting motors not only light but sufficiently strong and reliable to run for hours without attention. ", which contains some verifiable truth because the article "The Second Annual Exhibition of the Aero Club of America" (Scientific American, December 15, 1906, pp. 447-449) shows on page 449 a photo of an engine characterized as it follows: "The most interesting motor on exhibition was the new 4-cylinder, four-cycle, water-cooled engine built by Messrs. Orville and Wilbur Wright, of Dayton, Ohio, and intended for use on their new aeroplane." It is not quite evident why the Scientific American was so impressed by the new Wright motor as long as the same article shows the photo of another engine, made by the manufacturer Glenn Hammond Curtis, that was lighter and as powerful as the one of the Wrights and in consequence it was a better choice accepting both were equally reliable. Coming back to A. I. Root, on November 24, 1906, he wrote his friends in Dayton that Santos Dumont had gone most 1/4 miles (the real distance covered was 1/8 miles), a thing he had read in "Santos Dumont's Latest Flight" (Scientific American, November 24, 1906, col. 3, p. 378). Another letter of some importance is the one of April 16, 1907, sent by the old Amos to prepare his younger friends for a new visit he had scheduled for the 23rd or 24th of April 1907. By April 30, 1907, Root was already in possession of an article ("Wright Boys Score Another Triumph", Dayton Journal, March 21, 1907) which was promptly republished in Gleanings for May 15, 1907. The text is about a hydroplane publicly tested by the two inventors on March 21, 1907. Another newspaper, Dayton Herald, printed even a picture taken that day and showing two counter-rotating propellers with sprockets, on their axels, connected by bicycle chains to the shaft of an engine, everything being mounted on a floating platform without wings ("Newest Invention of Wright Brothers Will Carry Their Aeroplane on Water", Dayton Herald, March 21, 1907). The test was unsatisfactory but Root mentions in Gleanings for May 15, 1907, that in a talk with the Wright Brothers a few days before they said such an apparatus might, without question, make more than a mile a minute. The old aviation enthusiast ends his article with a few lines, dated May 2, 1907, and just received from the Wright Brothers as an answer to his April 30, 1907, letter. The text reads: "Our only objection to publishing any thing about our experiments is that it may cause people to write us for information, and we haven't the time for answering.". The motive invoked by the two inventors seemed plausible and the old Amos, after deciding to write something about the activity of his friends, also printed their letter as a means to warn the readers against sending any kind of inquiries to Dayton. However, the text can be interpreted more as a message for Root himself, aimed at stopping his annoying letters. The articles of the old entrepreneur from Medina about the two brothers continued till his death in 1923 but, with a few exceptions, they contain things gathered from various newspapers and magazines. Also, the flow of messages sent to Dayton reduced to about zero. During the summer of 1908, Root still had some weak direct contact with what he called "his friends", as can be seen in "The Wright Brothers and Their Flying-Machine; Also Something in Regard to Other Flying-Machines." (Gleanings, July 1, 1908, pp. 836-837) from which we learn a postcard had arrived from France. It contained just five words: "With kind regards, Wilbur Wright." that the old apiarist prized very highly because, for him, they were the evidence the elder of the two inventors still remembered his friend. Apart from this element of originality, the rest of the text is a compilation based on articles authored by others. A single letter of Root, dated July 28, 1908, can be found for the entire 1908 year. A journal, Woman's National Daily, scared him pretending that gangrene had set in in consequence of a burn W. Wright had suffered. He wanted clarifications from Orville, still located in the USA at the time, regarding the health of his brother. In passing, it is worth noting that, as concerned as he was, he could not abstain from begging again for an invitation to flight demonstrations. The articles Root published show he did not receive such an invitation in 1908 and 1909. He witnessed the first flight of a Wright machine on August 29, 1910, in the same place where he had seen the elder of the two brothers completing a circular course through the air on September 20, 1904 (according to his account in Gleanings for January 1, 1905). Root kept reporting in his journal about the activity of the two aviators. From Gleanings for September 1, 1908, p. 1097 we find out he expected them to be up in the air both in Europe and America" (Wilbur had already started to perform public flights in France beginning with the 8th of August 1908, Orville had not yet commenced his demonstrations in the United States). However, not the content of the September 1, 1908, article, that lacks details, is interesting, the readers being sent to newspapers and magazines for more information, but its title: "The Wright Brothers and Their Flying-Machine, Not Only "Out in the Open" but "Up in the Air"" which has the aspect of an irony. How can Root, a man who persistently declared he had seen W. Wright flying on September 20, 1904, could have written "not only out in the open" had he really witnessed a flight about 4 years before?! Such a title suggests the old beekeeper and businessman had seen the two brothers just out in the open. Another text of some interest is "The Wright Brothers and Their Aerial Flight up to Date" (Gleanings, September 15, 1908, p. 1156). Besides telling his readers about the successes of the two brothers, despite the fact he was well aware the newspapers were not only ahead of him but his source of information, A. I. Root disclosed an incident that happened in a morning when he was taking breakfast with the two inventors. None of them accepted coffee explaining to him they expected to make some flights that morning, and they had learned by experience that their heads were clearer and their nerves steadier if they abstained from coffee at breakfast. The September 15, 1908, account does not specify when this episode occurred but a much later memory ("Aviation and Stimulants. Saloons and the "Chicken Business. "", Gleanings, February 1919, pp. 110-112) locates it in the summer of 1904. As a remark, both texts (September 15, 1908, and February 1919) fail to clarify whether Root witnessed at least a flight that day or not. A Successful Experiment with a Motor-Driven Aeroplane. On December 17 the Messrs. Orville and Wilbur Wright made some successful experiments at Kitty Hawk, N. C., with an aeroplane propelled by a 16-horsepower, four-cylinder, gasoline motor, and weighing complete more than 700 pounds. This version of events, spread by the Virginian-Pilot newspaper ("Flying Machine Soars 3 Miles in Teeth of High Wind Over Sand Hills and Waves at Kitty Hawk on Carolina Coast", Virginian-Pilot, US, December 18, 1903, p. 1), was not supported by the Wright brothers who later came with clarifications and corrections as in "Wright Flyer. A Report of Late Tests is Given by Messrs. Wright, Inventors of the Machine." (Dayton Press, Ohio, US, January 6, 1904). These are their words regarding the best performance of December 17, 1903: "at the fourth trial a flight of 59 seconds was made, in which time the machine flew a little more than a half mile through the air, and a distance of 852 feet over the ground". However, as exaggerated as it is, the little story in the Sci. Am. has priority over the January 1, 1905, long tale in Gleanings and in consequence the old apiarist was at least ill-informed when he stated that his journal had announced the success of the Wright plane before the Scientific American had taken any notice of this wonderful invention. Root further explains that as soon as an impression was off the press he mailed a copy of it to the Scientific American, and sent a letter accompanying it, thinking they would be glad to give it a wider publicity than he could give in his comparatively little journal. His letter with the proof-sheets was received by the Sci. Am. that immediately asked for a copy of Gleanings, which was promptly sent. Unfortunately, this periodical, known worldwide, ignored Root's essay and had all reasons to do so as long as the text contained an account as fantastic as the one already published in its December 26, 1903, issue. Such an implausible story, supported by just one eyewitness, would have further discredited the Sci. Am. had it proved false. As a remark, Amos Root avoided to directly remind his readers he had seen Wilbur Wright completing a circuit through the air on September 20, 1904. He expressed his dissatisfaction regarding the attitude of the Scientific American with a carefully worded phrase: "not a word of thanks for the trouble I had taken to give them full particulars of what I had been an eye-witness". Another point of interest in the same November 15, 1908, article is Root's account about what he knew at the moment January 1, 1905, but was not allowed to divulge. He had been aware of two things since 1904: "The first was an apparatus for putting a stronger curve on the tips of the wings when rounding a curve. Second, a device that would enable the machine to spring up into the air as a bird does in starting.". After I left them I figured out in my mind that a derrick from which a weight could be dropped something like a pile-driver in order to get up a good momentum in starting would be a good plan. I was so full of this idea that I made a second trip in a short time, and was astonished as well as pleased to find they had got hold of the same thing and had it in practical operation. I am very anxious to know in regard to that plan of dropping a weight from a little derrick, that is, if you decide to undertake anything of the sort. These lines prove Root already knew about the project of using a starting device based on weights and a derrick, well before his second visit which took place on September 20, 1904, according to his claim in Gleanings (January 1, 1905, issue). If he really had such an idea then he discussed it with the brothers before August 23, 1904. When I first visited them they were obliged to run the machine along a single rail for, I think, 60 or 70 feet, in order to get up sufficient speed to "climb into the air." It is not clear whether he saw the plane flying or he just got the information from the two Wrights. Another text of some value is "Navigating The Air  The Wright Brothers up to Date" (Gleanings, April 15, 1909, pp. 258 and 29) which contains an interesting affirmation made by Root in the context of Katherine Wright's first flight (February 15, 1908, Pau, France). He says that when the Wright Brothers were making their first experiments out in that pasture-lot near Dayton, it was his privilege to take that same Miss Wright on a little trip around the lot with his little Olds mobile and then he continues: "At that early date I believe I had more faith in the ultimate outcome of their experiments than the old father, the sister, or even the two brothers themselves". Again, Amos Root refers vaguely to some experiments performed by his younger friends without saying he had seen the Wrights flying. Two month later, in "Animated Eggs  A Great Discovery" (Gleanings, June 15, 1909, p. 21), while detailing a finding of a member of his family, at least he strongly believed so and asked his readers to correct him if they had knowledge that somebody else was the originator of that invention, the old businessman made another puzzling affirmation: "GLEANINGS claims to be the first magazine to exploit the great invention of the Wright Brothers". One more time, the passage is imprecise and fails to explicitly state A. I. Root had seen a man carrying plane flying, in 1904. Also not something directly connected with aviation, it is worth mentioning that, one month later, in "Our Homes" (Gleanings, July 15, 1909, pp. 446-448 (p. 447)), Amos Root informed his readers that the newborn daughter of his youngest son had been named Katherine after Miss Katherine Wright who had become a celebrity of the time. Unlike the one in the July 15, 1909, issue, the editorial for the 15th of August ("Our Homes", Gleanings, August 15, 1909, pp. 515-518 (p. 516)) is a document of great historical value because it contains one of the most important pieces of evidence that throws serious doubts on the credibility of the January 1, 1905, eyewitness account. The general message of Root is that some texts like those in the Bible and his own story, about the September 20, 1904, flight in a circuit of W. Wright, have the stamp of truth on them even if they contain unbelievable things. "your readers all supposed that it was a made-up story. The way in which you talked about Christopher Columbus putting out on the unknown deep and all that, made people believe it was a sort of fairy story, such as we find in our magazines every little while  stories so much mixed up that one can not tell which is fact and which is fiction. The world did not believe you were telling the truth." "Mr. Chanute, I am in the habit of having strangers doubt my statements; but those who are acquainted with me, and know my way of talking, and those who have read my department in our journal for years past, ought to know that I tell the truth. Furthermore, that article has the stamp of truth on it from beginning to end. I mentioned the locality, and the things that happened, in a way that would convince any reasonable person that what I related really occurred." "Well, I guess that is so to a great extent; but what you are telling is too wonderful. The world is not yet ready to take it in." Certain people, certain books, and certain articles in the papers have the stamp of truth on them; and this New Testament account of our Lord Jesus Christ has the stamp of truth on every page. That "certain articles in the papers" is his January 1905 story which has "the stamp of truth on every page" as the Bible. The big question is why would Octave Chanute have had doubts regarding the veracity of Root's January 1, 1905, article as long as in a letter dated March 31, 1906, and published by the Scientific American in its April 14, 1906, issue, O. Chanute himself claimed he had witnessed a flight of 1,377 feet performed in 23 4-5 seconds, starting from level ground and sweeping over about one-quarter of a circle that was made by Orville Wright on October 15, 1904. In other words, at the time he read the January 1, 1905, article, Chanute had already witnessed a man carrying plane flying, less than one month after Wilbur's flight in a circuit of September 20, 1904. Logically, Chanute would have had all reasons to believe Root's eyewitness account! On the 15th of October, 1904, I witnessed a flight of 1,377 feet performed in 23 4-5 seconds, starting from level ground and sweeping over about one-quarter of a circle, at a speed of 39 miles per hour. The wind blew at some six miles per hour, but in a diagonal direction to the initial course. After the machine had gone some 500 feet and risen some 15 feet, a gust of wind struck under the right-hand side and raised the apparatus to an oblique inclination of 15 to 20 degrees. The operator, who was Orville Wright, endeavored to recover an even transverse keel, was unable to do so while turning to the left, and concluded to alight. This was done in flying before the wind instead of square against it as usual, and the landing was made at a speed of 45 to 50 miles an hour. One side of the machine struck the ground first; it slewed around and was broken, requiring about one week for repairs. The operator was in no wise hurt. This was flight No. 71 of that year (1904), and on the preceding day Wright brothers had made three flights  one of 4,001 feet for less than a full circuit of the field, one of 4,903 feet covering a full circle, and one of 4,936 feet over rather more than a full circuit, alighting safely. In addition to the great feat of inventing a practical flying machine the Wright brothers have, in my judgment, performed another improbable feat by keeping knowledge of the construction of a machine, which can only be operated in the open, from the incredulous but Argus-eyed American press. Chicago, Ill., March 31, 1906. The question is why would Octave Chanute, author of the book "Progress in Flying Machines" (1894) and well known by the aeronautic community of the time, have told such a lie. The answer is simple. On November 9, 1905, he sent a private letter to the French aeronaut Captain Ferber recommending him to trust the word of the Wright brothers, who had just claimed a series of spectacular flights. To make the statements of the two inventors more credible he wrote this: "I have not seen, with my own eyes, anything excepting a short flight of half a kilometer". Captain Ferber did not keep the text only for himself but had it published in "Les Frères Wright et leur Aéroplane à moteur" (L'Aérophile, December 1905, pp. 265-272, (p. 268)). Therefore, there was no way back for O. Chanute but to keep the story and pretend he had seen one of the brothers flying, otherwise his credibility in front of the technical world of the time would have suffered. Je viens de recevoir votre lettre du 26 octobre. Je crois que vous pouvez octroyer toute confiance à ce que les Wright vous ont écrit de leurs accomplissements (sic). Je n'ai vu, de mes yeux, qu'une petite envolée d'un demi-kilomètre, mais ils m'ont mandé leurs progrès de semaine en semaine et leurs amis intimes qui ont vu les longs parcours du commencement d'octobre, m'ont confirmé verbalement la semaine dernière, quand j'étais à Dayton, pour voir une envolée projetée de 60 kil. en une heure, qui n'a pu avoir lieu par raison d'un grand orage. Les Wright se sont inspirés de l'exemple de la France qui a tenu secrets ses progrès de ballons dirigeables depuis 1885. Ils se sont arrangés avec leurs journaux à Dayton. Il y a bien eu une indiscrétion et un article publié, mais sa circulation a été supprimée. Agréez, cher monsieur, l'expression de mes sentiments les meilleurs. After all these explanations the August 15, 1909, article of Root about his dialog with O. Chanute, a few years before, can be more easily understood as a conversation between two people who had never seen a man carrying heavier than air machine flying. In 1904, when I told you about the Wright brothers, and a little later when I told you at length what I had seen with my own eyes, I said at that time that their discovery (that the air could be traversed without the aid of balloons or gas of any kind) would make a sensation in the world akin to the discovery of America by Christopher Columbus. He is one more time vague and avoids repeating what exactly he saw. At the end of the text, he noticed with disappointment his good friends had been already left behind. As an explanation, a competition took place in France at the end of August 1909 and all records established by W. Wright on December 31, 1908, were broken. I am trying to be honest and sincere from daylight to dark, and every day in the week; but with shame I confess that a good many times I can look back and see that I have made bungling work of it". The credibility of an implausible story, like the one about the September 20, 1904, flight of W. Wright, coming from a man that struggled to be honest, as Root himself declared, is quite low. August 29, 1910, a real important date, at least for A. I. Root, who finally saw, that day, with his own eyes a Wright plane flying. Unlike the January 1, 1905, fantastic tale, the write up "Then and Now. The Wright Brothers and Their Flying-machine up to Date." (Gleanings, September 15, 1910, pp. 602-604) with the account of what this businessman from Medina had seen near Dayton at the end of August 1910, is realistic, giving convincing details about what happened during his visit and while watching the plane taking off, circling the field and landing. Root starts the article with the last lines of his "Our Homes" for October 15, 1904 (pp. 987-988). He said then that a machine that would "float as easily and safely as the bees, the butterflies, and the carrier pigeons was already in sight" which does not clearly mean a reality, something he had already witnessed on September 20, 1904. However, in this case, Root had an excuse because he had not received yet, in October 1904, the permission of the two brothers to write about their invention. A. I. Root continued the introduction with his repetitive claim regarding seeing the Wright brothers making their first successful flight emphasising that: "Gleanings was the first periodical on the face of the earth to announce to the world the crowning success of their years of experimenting in order to make a machine that would fly without a balloon". It is not certain what he meant by "the crowning success". If he had in mind a long flight with a plane that made turns than Gleanings might be considered the first bimonthly which reported about such an achievement. However, as long as the newspapers in Dayton had already given, before the end of 1904, descriptions of flights more spectacular than the one presented in the January 1, 1905, issue of Gleanings, any priority claimed by Root, in announcing the final accomplishment of his younger friends, is null. In order to demonstrate the efficacy of the aeroplane, a flight was made yesterday and a distance of three or four miles was made with perfect ease and precision. The machine proved perfectly dirigible and sudden and short turns were made with the same ease as the flight was maintained through a straight course. The Wright flyer is the only machine that ever lifted a man off the ground. The other inventions of this character have been of the airship variety, while this is a true flying machine and is operated by means of aeroplanes, that serve as wings to carry the machine through the air. An even higher rate of speed is contemplated for it than has so far been achieved, as now, merely to avoid the necessity at this time of rearranging the engine and other equipment sufficiently to maintain the equilibrium of the machine, a weight of about seventy-five pounds was carried on the flight made yesterday. The flight was made at a height of about forty feet above the ground. It had been contemplated by the Wright brothers to make several spectacular flights for the benefit of the public, but the weather has now become unfavorable for the best results and the work will be abandoned until next spring. The Wright brothers are especially gratified with the result of their experiments, inasmuch as experts have announced that the flight over the distance of a mile, together with the ability to pursue a circuit, would solve the problem of air navigation. Both have been accomplished and an excellent degree of efficiency attained in both. The new machine, which is 20 feet from rear to front, and 40 feet from tip to tip, is the first machine to make complete circles. Since September 20, the Wrights have made 20 complete circles with the machine. The machine carries no gas bag, but depends entirely on its gasoline engine for propelling power. The weight of the flyer is 900 pounds. Coming back to the September 15, 1910, article, Root says that at about 2 PM, on August 29, 1910, he reached the old familiar field between Dayton and Springfield with an invitation from one of the brothers. At first, he was disappointed because none of his two friends was present but after being informed by the young aviators, who were present there, they would soon sail through the sky without any assistance from the Wright brothers, his disappointment began to give way. People started to gather. One of the Wright machines was pushed outside of the building that housed it. Neither the catapult nor the rail was used. The plane had pneumatic tire wheels and rolled on them. Root continued with a credible eyewitness description of the take-off procedure, giving precise technical details in deep contrast to the fantastic January 1, 1905, account. The pilot took his seat, two other people did the cranking by turning the propellers and a fourth man held the plane in place till the propellers reached their full speed. At a signal from the pilot, the machine was liberated, gained speed, the tires pressed less and less the ground and finally the plane rose gracefully into the air. It started to do circles and eights. When it went with the wind the speed appeared to be one mile a minute but when it made turns and especially when the apparatus came against the wind its speed diminished considerably in a visible way. Root also witnessed the plane flying with two people on board. This time the machine did not ascend so easily but finally it left the ground. 1) "I asked one of the Wrights what the comparative expense was going to be for gasoline compared with the amount needed, say, to carry four people in an automobile. He said he thought the flying-machine would take less gasoline to do the same work". As a remark, there exist planes that use less fuel/passenger than a car, so the answer given by one of the brothers contained some truth. The Wright brothers are at present employing 25 to 30 hands". About 6 Wright planes in service, spread across the entire US at the end of August 1910, was not a large number. The two brothers did not have too many clients. 4) "Once more, all the inventors of the world, for ages past, have never made any machine that would fly even a few rods  that is, and carry a passenger  until the Wright brothers did; and, if I am right about it, no one has ever since made a machine that would fly without making use of some feature of the Wright invention.". Again the same old story according to which the two Daytonians were the first to fly an airplane, also no credible witness beyond any doubt saw their flight capable powered machine, in the air or on the ground, before 1908. No pictures or technical drawings, of a Wright plane, published before 1908, exist. 6) "Some of the papers reported the Wright Bros. had found a better engine in France than could be made in our country. Wilbur says this is untrue." I then remarked to the brothers, "How long will it take for the flying-machine to go through a like evolution?" Orville replied at once, "Mr. Root, the flying-machine has already passed the period of evolution;" and he pointed me to the fact that the machine I was looking at that day, and admiring, was but slightly different in its main features from the one I saw years ago.". Orville Wright later came with clarifications, which softened such a ridiculous statement, admitting that there would be many improvements but the successful flying machine would likely have propellers to push it through the air. 8) "Inventors all over the world have tried "something different"  machines to float by the flapping of wings, as a bird flies, for instance; but their machines did not fly  that is, they do not fly unless they make it pretty near something in the line of following the Wright brothers from first to last.". In reality, the historical evidence tells a different story. As an example, on November 18, 1907, Orville Wright, who was in France at that time, witnessed Henry Farman performing a series of flights in an attempt to win a prestigious aviation prize. The Wright brothers had not yet shown any plane up to that date. Their heavier than air apparatus was still a phantom. The public first saw a Wright machine on August 8, 1908, at Le Mans, France. In consequence, it was the Wright brothers who followed other inventors, not the opposite. Mr. Orville Wright Sees Mr. Henry Farman Compete for Deutsch-Archdeacon Prize. Mr. Henry Farman came within an ace of winning the Deutsch-Archdeacon prize of 50,000fr. with his aeroplane at Issy-les-Moulineaux yesterday afternoon. Had his motor worked with a trifle more regularity the money was his. He made at least ten excellent flights, but each time at the critical moment, when the apparatus with perfect balance was describing the curve the motor appeared to lack the necessary force, and the apparatus touched the ground. The first flight, which took place about half past two, was one of some 600 mètres, finishing with a semi-circular movement, during which the wheels touched the ground. This was followed by half a dozen similar flights, all with the same result. Just before dusk a final effort was decided upon. This time the machine left the ground easily and traveled down the field to the turning point at a good rate of speed. In the turning the wheels touched for an instant and again a few seconds later, but after this the rest of the circle was completed with ease. For a moment the spectators appeared to think that the prize had been won, but this was not so. To win this Grand Prix de l'Aviation it is essential to complete the kilomètre in a closed circle without touching the ground in any way. Asked by a HERALD correspondent to give his impression upon Mr. Farman's flights, Mr. Orville Wright said he did not care under the circumstances to say much on the subject. In his opinion the flights accomplished by Mr. Farman were excellent, though he was surprised that the Deutsch-Archdeacon prize had not been won some months ago. He thought that so far as flying in France was concerned, Mr. Farman easily took the lead over everyone else. He considered Mr. Farman an ideal aeronaut, and one who would probably help to develop the art of flying in a very great degree. Perhaps the most important words written by Root in the entire September 15, 1910, article are: "During my first visits, years ago, before their patents were secured, I was asked to omit certain things in my write-up; but when I to-day asked if I could describe all I saw Wilbur replied, "Mr. Root, you may tell any thing you choose about our work, providing you tell the truth."". The remark made by the elder of the two brothers further disqualifies the old apiarist as a credible witness because it implies that he had not told the truth, all the time, in his previous articles about the two inventors and their machines. "The Wright Brothers' Up-To-Date Flying-Machine" (Gleanings, October 1, 1910, pp. 628 and 640-641) is a continuation of the September 15, 1910, text and contains an interesting commentary of Root. During his August 29, 1910, visit, he noticed that the students of the two inventors "swung around in a very large circle as there was quite a brisk wind". Orville Wright explained to him that an expert aviator could make tight turns if the wind was weak. In other words, the planes of the two brothers, known as being highly manoeuvrable, needed ideal weather conditions, otherwise they could not turn exceptionally fast. Regarding the tight turns Root further noticed that "at a meeting in Boston, some of the Wrights' pupils were swinging their machines around on so short a curve that Wilbur interfered, and forbade their taking any more such risks". The air show Root referred to was organised by the Harvard Aeronautical Society being the largest aeronautical meeting held in America up to that time. It took place between September 3 and 13, 1910, and unofficially continued three more days ending September 16, 1910 ("Harvard-Boston Meeting", Aeronautics, October 1910, pp. 115-118). The great winner was the English aviator Claude Grahame-White who earned various prizes totalizing $22,100 plus $7,500 the contract price for entry. The second and third places were occupied by two pilots, Johnstone and Brookins, flying on Wright machines. They won $5,000 and $4,250, respectively. The contract price for entry of both was $30,000 which means that they earned sensible more money just for participation than from scoring points! "when I told you five years ago what I saw the Wright brothers do, I felt sure that flying would be a common thing in a year or two"
The first part of the text is about the religious belief of Root, which was also shared by the two inventors, that a good Christian has to keep Sundays as holy days, days of rest from all of our duties and cares, and not even transform them in holidays. As an illustrative example of what can happen if somebody does not respect this special day of the week, Amos Root presented the case of Eugene Ely, the only pilot who decided to start on Sunday, October 9, 1910, from Chicago with the intention to reach New York by the end of the week. All kind of bad things happened to him and finally he was obliged to abandon. The Wrights and others refused to fly. Incidentally, Eugene Ely flew on a biplane made by Glenn Curtiss, seen by the two brothers as their enemy, a man who used without right what is known today as ailerons which the two inventors claimed to be their own discovery. In reality, a description of ailerons appears in an English patent (A.D. 1868, 5th February. No 392) obtained by the inventor Matthew Piers Watt Boulton. During the afternoon this one machine made four flights of three to five minutes each. There were no trials for duration, no trials for altitude, no speed contests, no flights with passengers, and no feats to compare with the ones the Wright students made on the afternoon I visited them. In fact, the whole afternoon seemed to be spent in fussing with the machines to make them go. It takes the combined efforts of a dozen men to haul the Wright flyer around on its cumbersome, wide-tired wheels and adjust it on the starting-rail before it is as nearly ready for a flight as is the Curtiss machine at all times. The Wrights are content, on the other hand, with a machine which trundles along at forty miles an hour, and which must either return to its starting-rail before flying again, or else have the starting-rail brought to it. It never took a dozen men to haul around the Wright flyer, even in their first experiments. I know, for I was there; and at the very time this statement was made, it did not take any men (or boys either) to get the Wright flyers up to the starting-place. The aviator just starts his engine, and the propeller which carries it over the ground or through the air takes it up to the starting-point, even if it is up hill. One more time, the old beekeeper mentions the first experiments of the two inventors, witnessed by him, without saying he had seen the plane flying. However, he comes with something new, never said before, Root saw, in 1904, the Wright machine being moved around on the ground by less than a dozen men. I have been informed on good authority that Glenn H. Curtiss visited the Wright brothers before he made a flying-machine at all. They extended to him every courtesy, and permitted him to look their machines all over at his leisure; but it would seem that, as soon as he left, he copied their machine as near as he could without too flagrant an infringement on their patents. At present I know nothing about the suit for infringement. In reality, the Curtiss planes were single pusher biplanes similar to the 1907 Voisin machine. Such an apparatus, driven by Henry Farman, was seen flying by Orville Wright on November 18, 1907. Glenn Curtiss himself flew 1 kilometer, at Hammondsport, NY, on July 4, 1908, piloting a biplane, built by the Aerial Experiment Association, that was quite similar to the 1907 Voisin apparatus. The double pusher Wright biplane became known to the public on August 8, 1908, in France, at a moment when the heavier than air flying machine was already a reality. Toward the end of the article, Root comes back to the bad things that happen if people fly on Sunday, giving as an example a failed aerial show that disappointed 7500 spectators at Belmont Park, Long Island, NY, on October 23, 1910. Also the Wright team, composed of the pilots Hoxsey, Brookins, and Johnstone, was willing to fly, Wilbur Wright could not be convinced by the show organisers to allow his people to take off on Sunday, a thing highly appreciated by his old friend from Medina. 1) "Sunday Papers, E. G. Lewis, Etc." (Gleanings, February 15, 1911, p. 119) starts with a letter addressed to Amos Root by a woman who considered the "funny sheets" of the Sunday and daily papers had a ruinous effect upon the minors. Root agreed that the very worst and most mischievous things somehow seemed to find a place in the Sunday daily and, to illustrate his statement with an example, he presented the case of a misleading Sunday article which made him believe a large number of flying machines were competing at the 1904 St. Louise exposition. After forwarding the paper to the Wrights he was informed by them that no such machines were on exhibition at St. Louis, and never existed at all except in the imagination of the reporter who was paid for "telling lies". 2) A short paragraph in Gleanings (March 15, 1911, issue, p. 160), which belongs to an extensive article signed Dr. C. C. Miller, quotes a text (ALIN CAILLAS, L'Apiculteur, p. 464) with some calculations, based on pure assumptions, regarding the distance covered by a bee each day and the total length traveled by the bees of a colony to make a certain quantity of honey. At one point in the paragraph a remark about the two Daytonians is made: "As flyers, the Wright brothers are not in it with the bees." which has an unclear meaning. An interpretation would be that the two inventors did not fly as often as a bee. 3) In another column ("The Question of a Winter Nest and Its Relation to Locality", Gleanings, March 15, 1911, p. 191) Root just made this joke: "I want to whisper a word to my good friends the Wright brothers. A year or two ago they made some experiments on a craft partly in water, and partly in air. Well, my ducks are experts in that trick.". As an explanation, the two inventors publicly tested a hydroplane (without wings) in March 1907 ("Newest Invention of Wright Brothers Will Carry Their Aeroplane on Water", Dayton Herald, March 21, 1907). 4) The April 1, 1911, number of Gleanings, on page 198, contains a passage signed by a certain Mrs. H. G. Acklin, of Glendora, California, who, apparently talking seriously, asked the editor of Gleanings to tell the Wrights to perfect their flying machine so that moving bees, supplies, and honey, to and from mountain canyons, by air, would be feasible. As a remark, Root had already come with a similar idea in "Flying Apiaries" (Gleanings, May 1, 1907, p. 620). 5) Another text that contains some references to the Wrights is "Potatoes Shipped From Florida To Alaska" (Gleanings, August 1, 1911, p. 478). A newspaper article about an order, coming from Seattle, for three railroad cars of Hastings potatoes grown in Florida which were finally to be shipped to Alaska, triggered in the mind of the old Amos another unrealistic application of the flying machines. Also he realized it would take some time, he still had a faint hope to see potatoes delivered by plane from one extremity of the United States to the other. "The Wright Brothers up to Date, and Something About Flying-Machines" (Gleanings, November 1, 1911, p. 674) and " Fireless Cookers, Fireless Brooders, etc., and, Finally, the "Fireless Aeroplane" " (Gleanings, March 1, 1912, pp. 147-148) are two articles about the powerless flying-machine of Orville Wright who had left the ground on a glider, without any power whatever, and had gone up in the air and had remained stationary for almost ten minutes. Root did nothing else but to repeat a story run by the newspapers of the time. An example of column announcing the great achievement of the younger brother is "Remains Almost Stationary in Air. Orville Wright Goes Up in Glider in Fifty-Mile Gale." (The Times Dispatch, Richmond, Virginia, October 25, 1911, col. 3, p. 1) which talks about O. Wright who drove a glider for a record time of 9 minutes and 45 seconds, on October 24, 1911. However, there is no word about the presence of some official witnesses able to certify such a feat. Wilbur, who was not involved in those trials as can be seen from his October 27, 1911, letter sent to L'Aérophile, had heard no word himself from his brother regarding his experiments in Kitty Hawk and had not the real facts himself. Also, he recognised in the newspaper reports a mixture of actual glides and many fanciful stories which he readily detected as probably fabrications. Even for W. Wright, it was difficult to extract the truth from the media accounts. A last word about the November 1, 1911, text would be that the old Amos used it, like many other of his columns, more as a pretext for stressing again that "GLEANINGS was the first periodical in the whole wide world to announce the Wright brothers had made a flight of something like a mile, and whirled round and come back to the place of starting". In the March 1, 1912, article, Root comes back to the topic "fireless aeroplane" due to a short text, he had read in the Cleveland Plain Dealer, which sounds more like a joke. Even if he realized the paragraph could have been just newspaper pleasantry, the old businessman expressed his intention to go and see that "fireless" and then tell his readers more about it. Another thing that should be mentioned is that the Wright brothers and their sister had not yet completely forgotten their old friend because Root thanked them, in the same article, for their Christmas greeting sent about the first of January 1912. "Chicken Thieves; What Shall We Do To Protect Our Valuable Stock From Their Depredations?" (Gleanings, March 15, 1912, pp. 182-183 (p. 182)), also starts with a totally discouraging title, contains an information of interest because, at one point, the old entrepreneur and apiarist affirms that when he was witnessing the early experiments of the Wright Bros. he boarded with a farmer. In a later article, " Aviation and Stimulants. Saloons and the "Chicken Business." " (Gleanings, February 1919, pp. 110-112), Root gives further details saying that in that eventful summer, the farmhouse where he had board and lodging was kept by a renter by the name of Beard. Nights and mornings, before the Wright brothers got around, he became quite well acquainted with Mrs. Beard who was an invalid suffering from lung trouble. In a letter to his friends in Dayton, written between the 22nd and 26th of September 1904, the old beekeeper wrote that Mrs. Beard had promised to take care of his wife. Root wanted to have his wife enjoy with him that wonderful creation of the Wright brothers. All these represent evidence that, in the summer of 1904, the importunate aviation enthusiast was the guest of a person who lived close to the place near Dayton where the two brothers performed their experiments. Again there is no word from the old Amos regarding the flights he saw that summer. "Early experiments" does not automatically mean a plane travelling through the air. A. I. Root himself does not mention Mr. or Mrs. Beard as witnessing any flight but in a letter dated December 6, 1904, and addressed to the Wrights he expresses his satisfaction that "Orville went around four times without stopping on Dec. 1st. ", an information he had obtained from Torrence Baird (identified as Torrence Beard, the son of the farmer David Beard), a man Root had asked to keep him updated, regarding the flights of the two inventors, with messages written on postal cards. However, D. Beard appears as an eyewitness in a French article ("Nouveaux Détails sur les Frères Wright et Leur Aéroplane", L'Auto, Paris, December 31, 1905) which is a translation of a letter written by Harry M. Weaver the brother in law of Frank Samuel Lahm, an American aeronaut living in Paris. At the request of Lahm, Weaver, who lived in Ohio, went to Dayton on December 3, 1905, to investigate the claims of the two inventors, especially the credibility of the spectacular series of flights that had ended on October 5, 1905. At one point he was brought by Orville Wright to a person identified as D. Beard who lived close to the field where the tests had been made. David Beard told Weaver about experiments that had been taking place in front of his eyes for a long time and assured him there was no doubt regarding the flights which he had remarked often and especially the series that ended on October 5, 1905. Pour des raisons faciles à comprendre, les frères Wright ont tenu ces expériences aussi secrètes que possible. Les voitures du tramway électrique passent toutes les trente minutes; ils ont arrangé leurs vols en conséquence et ont ainsi pu éviter d'être remarqués des voyageurs. Les fermiers d'alentour sont les seuls qui aient eu l'occasion de bien voir les expériences; après deux ans d'essais, ils étaient blasés là-dessus. Neither the postcards of T. Beard, sent to A. I. Root, nor the declarations of his father, D. Beard, in front of H. M. Weaver represent solid evidence the Wrights had flown. Both of them, son and father, look like fraudulent witnesses instructed to tell lies. It is self evident that Orville would have brought Weaver in front of D. Beard only if he had been sure that this farmer was to confirm the flights. Also, the old Amos would have been directed to lodge in another location in 1904 had the Wrights have been uncertain about what the Beard family would tell him about them. the flying-machine that the Wright brothers are still pushing further and further, that is to be the great excitement of the whole wide world in just a few weeks more". It is not clear what specific thing was in the mind of Root. He could have referred to the powerless or fireless aeroplane of Orville. The death of Wilbur, on May 30, 1912, determined his old friend to dedicate two articles to him in Gleanings for June 15, 1912. The first, "Wilbur Wright; What our President and Army Officers Have to Say in Regard to His Untimely Death." (Gleanings, June 15, 1912, p. 21), is simply a series of quotations with the words of three main politicians of the time, including the US president, William Howard Taft, the only one who considered Wilbur as "the father of the great new science of aeronautics". The secretary of war, Henry Lewis Stimson, referred to him as "being probably the foremost exponent of aviation on this side of the Atlantic" and major general Leonard Wood, chief of staff of the army, regarded the same inventor as "the foremost figure in aviation in America". While Wood saw Wilbur as the most important aviation pioneer in the US (he did not say "in the world"), Stimson was not even sure the first born of the two brothers deserved such an honour inside the United States. He used the word "probably". The other article ("Our Homes. Death of Wilbur Wright, the Older of the Wright Brothers, of Dayton, Ohio. ", Gleanings, June 15, 1912, pp. 385-387) is more about A. I. Root who again tries to make credible his January 1, 1905, story by repeating that it was his privilege to be present when the Wrights made their first flight of a mile or more, and turned a circle and came down to the place of starting. The text is largely a recap of what Root had already said on various occasions, in Gleanings, about his pre-1908 visits to Dayton and the place where his younger friends performed their experiments. From the first paragraph, the readers of his periodical are reminded that in the March 1st issue of GLEANINGS for 1904 Amos Root first made mention of the two men, Orville and Wilbur Wright. He continues by stating that he made many visits to the field just outside of Dayton, where they were experimenting during the summer of 1904, without explicitly saying when those visits took place. For a while he was not allowed to publish anything regarding the activity of the two brothers but finally, in the issue for Jan. 1, 1905, of Gleanings, he was given permission to write up what he had witnessed. Root does not forget to stress that his article was the first detailed account given in any periodical in the world of the experiments and final success of the Wright brothers. However, it should be noted that he adds an "if I am correct" which means he wanted to vaguely suggest he was not 100% sure. Root was perfectly aware the credibility of his January 1, 1905, story had been quite low because this is what he tells us: "My write-up of the event was so astonishing that many people thought it was a piece of fiction to advertise our journal; and even so good an authority as the Scientific American did not see fit to credit my account". Root continues by explaining the Sci. Am. finally apologized for its want of faith at first, in his plain and simple story, but he does not bring any evidence. A large part of the article is dedicated to the September 20, 1904, flight. The old Amos presents a more detailed version of the event but he omits to say what date it happened. He remembers that one day he came on the ground just as the Wrights had succeeded in making the plane turn a curve so as to fly at right angles to its course. This is a flight A. I. Root does not say he witnessed. As a parenthesis, Wilbur Wright's 1904-1905 notebook, pp. 18-19, contains information about two flights, both of them performed by the elder brother on September 20, 1904. The first one, marked no. 51 in a list of many pages, is 2520 ft in length and its trajectory has the shape of an S. The path followed by the second flight (no. 52), of 4080 ft, looks roughly like a circle. However, Wilbur's notebook does not confirm in any way Root's account regarding the flights of September 20, 1904. The old Amos and the two Daytonians exchange many letters during 1904, they also met, and so there is no guarantee that a copy of Wilbur's notebook, page 18 and 19, containing data about two fictitious flights, did not reach the old beekeeper who, based on the information available there, wrote a piece of fiction. Coming back to the June 15, 1912, article, we learn that Root found the two inventors preparing for their second flight of the day. They were about to abandon because of a thunder cloud but the old aviation enthusiast suggested to them that they would have plenty of time to get around and get the machine safely housed. Finally, Wilbur decided to fly, he turned the curve at the end of the field, as before, and turned still another curve, and came around to the starting place. Instead of landing, the plane unexpectedly continued his course in a straight line, a thing that alarmed Orville, Root and "the mechanic", a person who is not named but can be identified as Charles Edward Taylor, the only employee of the Wrights. (According to the notebook that was already mentioned, two people, identified by their initials OW and CET, timed Wilbur at 1 min 35 2/5 sec and 1 min 35 1/5 sec, respectively.) This tense situation did not last too much because the engine stopped, and the machine alighted as safely and as gently as a feather. The old Amos and the other two people, who had watched the demonstration, hurried to the place where the plane had come to rest but, as he was considerably older than Orville and the mechanic, he was left behind and when he reached that location he found the two brothers arguing, the elder (the pilot) blaming the younger for the fact he was not been able to stop the engine when he came back to the starting-place. A. I. Root intervened and with a hand on Wilbur's shoulder told him that he should thank God for having permitted him to make the first flight since the world began, turning corners, and coming around to the stopping-place. Only then the elder brother realized the importance of the moment. It is not difficult to realize that Root, a man who filled his journal with the pronoun I, simply speculated the death of Wilbur to emphasize again, in a moment when nearly all readers of his journal had heard about this aviator from Dayton, that he was the first witness (other than the Wrights and their employee) of a flight in a circuit made by a man carrying plane. "Mr. Chanute, I have no ambition to be a millionaire. So far as I am concerned, I think a hundred thousand dollars would be all I should ever have use for in this world." Wilbur might have made such an affirmation because the Agreement between the Wright Brothers and Arnold Fordyce (December 30, 1905) specified that their plane would be bought by France for the sum of 1,000,000 francs (200,000 dollars  not so far from that "modest" one hundred thousand Wilbur talked about in the presence of A. I. Root and O. Chanute) if some conditions were fulfilled. Root does not explicitly say when he saw O. Chanute but in "Our Homes" (Gleanings, August 15, 1909, pp. 515-518 (p. 516)) he states he met the mentor of the two brothers a few years before July 30, 1909. The June 15, 1912, and August 15, 1909, articles might refer to the same visit. Another episode, mentioned by the old beekeeper, happened one day they were all out in the field with the machine while there was a cool northwest wind. Unfortunately, the old Amos misses again the opportunity to precisely locate in time that event but from "Our Homes" (Gleanings, April 1, 1905, pp. 373-376 (p. 375)) it is clear the incident happened in the autumn of 1904. Root just repeats what he already said. Wilbur was in his shirtsleeves and when Root told him he would catch a cold he answered: "That is not the way people catch cold as a rule.". According to the elder of the two brothers, people catch cold, by keeping themselves shut up in hot and poorly ventilated rooms and perhaps they may take cold by going out from such places. Another thing the old beekeeper talks about is the request of the two Daytonians, made during his first visit, and while the Wrights were making application for a patent, regarding certain things Root was asked to avoid mentioning in print. A paragraph of the June 15, 1912, text is dedicated to the honesty of Wilbur. On his last visit, that was described in "Then and Now. The Wright Brothers and Their Flying-machine up to Date." (Gleanings, September 15, 1910, pp. 602-604) Root, after witnessing flights performed with a Wright machine, asked if he could present in his journal what he had seen. Wilbur replied: "Mr. Root, tell any thing you like, providing you tell the truth, and only the truth.". Root explicitly quotes his Sept. 15, 1910, article and the answer of the elder brother is taken directly from that issue, so it brings nothing new. In the next sentence, the old Amos wonders how many proprietors of the American establishments would have instructed a reporter of a magazine to avoid exaggeration in his relation of what he had seen. In the opinion of the old beekeeper, the remark of Wilbur was a confirmation of his sincerity. However, another more logical interpretation can be offered. The elder of the two brothers knew that his older friend had the habit to lie in his write-ups and as long as, in 1910, he no longer needed overstatements about his planes and activity in general, he stressed that Root should not depart from the line of truth. The old Amos also emphasises that it was his pleasure several times to share Wright's noonday lunches put up by that good sister Katherine. As in other articles, Root does not forget to prize the respect Wilbur paid to the holy day of the week by refusing to fly or even exhibit the machine on the generally recognized Sunday of the world. He also highly appreciated the invariable reply of the Wrights: "Gentlemen, we are not in the show business. ", each time they were asked to exhibit their machine at State fairs or great expositions, even if big sums of money were offered to them. Root concludes by remarking that "the years they labored in perfecting their invention were not for the purpose of making money. It was to bless humanity.". This is a totally personal and not supported by evidence opinion. If the Wrights had not been interested in getting rich, and their only desire had been to bless humanity, they would have given their invention to the world for free. Instead they just repeatedly claimed, starting with December 17, 1903, that they had flown in 1903, 1904 and 1905, making a lot of noise in newspapers. They showed no picture or technical drawing of their powered planes, before 1908, and finally the aviation appeared in France in 1906 without their help. The next article in line is "The Wright Brothers' Flying Machine in the Year 1912" (Gleanings, September 15, 1912, pp. 589 and 593). Some businessmen of Medina decided to bring a Wright plane on the local fairground on the Fourth of July. They were asked to pay $1000 for three demonstrations with a total duration of no less than 45 minutes. According to A. I. Root, the flights were a perfect success in every respect. He was present during all the flights and preliminaries and, while the apparatus was standing on the ground, he had a picture taken of himself, occupying the passenger seat, and the pilot Oscar Brindley. He further explained that the Wright Brothers only manufactured the machines, having nothing to do with renting them out for fairtime. Root had a long talk with O. Brindley who entirely agreed with him in thinking that there was but little danger of loss of life if the instructions furnished by the Wright Brothers were strictly complied with. To support such an affirmation he presented two examples of flights that ended tragically. The pilots are not named and it is not clear who manufactured the planes. In the first case, a crowd of people pressured an aviator to fly in conditions considered unfavourable by him. In desperation, he took off, had an accident and died. The second example is about a pilot who attempted a dive at great speed with a machine heavier than the ones he had ever operated before. The apparatus had a mechanical failure, near the ground, generated by the shock induced when it received the command to lift its nose up. It crashed and the pilot had the same fate as the first. However, whether the advice of the two inventors could be followed is debatable. Root himself, unwillingly, furnished two examples having Brindley as a protagonist and him as a witness. During one of the flights, a wing touched a telephone wire. Later, the same aviator failed to get off the ground due to a gust of wind. "The High Cost of Living, etc. ; Something About God's New and Precious Gifts." (Gleanings, March 1, 1913, pp. 166-168 (p. 166)) and "The High Cost of Living; How our Missionaries May Help to Reduce It." (Gleanings, July 1, 1913, p. 471-472) are two articles having, as their central point, a new vegetable, for the farmers in the US, called "dasheen". In both texts, the two inventors from Dayton are mentioned in passing. Root read about this unfamiliar plant, got enthusiastic, ordered samples and finally expressed his intention to make a present of a dasheen tuber to every reader of GLEANINGS who sent the subscription price for one year. The old entrepreneur and beekeeper transformed in farmer started his March 1, 1913, column with a different subject, talking about his Buttercup chickens. One generation, that was three weeks old at the time, had learned, in order to save the trouble of climbing over a high door step, just to spread their gauzy wings and sail out like a Wright flying-machine, for all the world. In the second text (July 1, 1913), the old Amos reproduced a letter of a missionary in South Africa who received Gleanings for free and realizing he would not meet the conditions to get automatically a tuber decided to contact the editor of the journal and proposed him a deal, that was immediately accepted with great pleasure. Just to tell who he was, the missionary reminded Root that, due to him, he had been able to meet the younger of the two Daytonians. Here are his words: "It was through your kindness in sending me a letter of introduction to the Wright Brothers, while I was at home on furlough year before last, that I met Mr. Orville Wright (also father and sister), and saw him fly." "Remember the Sabbath Day to Keep It Holy" (Gleanings, September 15, 1913, p. 659) is another text of Amos Root where the central figures are the two aviators. The small article reproduces a few lines from a publication of a religious character, the Sunday School Times, that prized the determination of the two inventors to keep the Sabbath day holy even when the monarch of Spain asked W. Wright to perform a flight demonstration for him. The elder brother refused. The paper does not specify the date of this incident, localising it in time just with the explanation: "when Wilbur was at the high tide of his first foreign success, and was acclaimed everywhere" which means the years 1908 - 1909. There are 1909 documents, one of them being "Alphonse XIII chez les Wright" (L'Aérophile, March 1, 1909, pp. 107-108), but they talk about Wilbur flying in front of the sovereign at Pau, France on February 20, 1909 (that fell on a Saturday). The king Alphonse XIII of Spain witnessed two flights. The first lasted 28 minutes, the plane being manoeuvred by W. Wright. The second was 13 minutes long. This time Compte de Lambert was the pilot and Wilbur just occupied the seat next to him. It is true that the two aviators avoided flying during the holy day of the week but there is no evidence the story in the Sunday School Times is real. However, the same paper is right when stating that from their father, good old Bishop Wright, they inherited two sterling traits  character and a shrewd business sense. The two inventors, or at least the elder, knew how to run affairs otherwise they would not have scammed the French government making it pay them 25,000 francs as penalties, in 1906. No plane was shown, not even one standing still on the ground. This episode was already explained. You can reread the paragraphs that contain references to the "Agreement between Wilbur and Orville Wright and Arnold Fordyce" (December 30, 1905) and the letter of the French war minister, dated September 4, 1906 ("Le ministre de la Guerre à M.M. Wright frères 1127 West Third Street Dayton-Ohio", Paris, le 4SEPT1906). Root finished his moral lesson by expressing a lot of admiration for Wilbur who was not afraid to stand up before men, even kings, and confess their respect for God's holy word. The next two articles in Gleanings related to the Wrights (January 15 and February 15, 1914, issues) treat a variety of topics that will be explained one by one in detail. Starting from the pretext that his journal was the first periodical on the face of the earth to give an eye-witness account of the Wright brothers' first flight to make the machine come back to its starting-point, A. I. Root considered his journal should occasionally notice the progress that was being made in navigating the air. 1) The first big aviation achievement of the time, that attracted the attention of the old beekeeper, consisted of a series of spectacular flights performed by Adolphe Pégoud, a pilot who succeeded at Juvisy, France in flying, with his Blériot-Gnôme 50 HP plane, upside down on September 1, 1913, and then he looped the loop at the Blériot airfield, Buc, near Paris, three weeks later, on the 21st of September. Details about these aerial stunts can be found in L'Aérophile ("Une audacieuse expérience de Pégoud. Il vole la tête en bas décrivant un S magistral. ", L'Aérophile, September 15, 1913, pp. 420-421) and ("Pégoud poursuit ses extraordinaires expérience. Il remplit son audacieux programme et boucle la boucle plusieurs fois. ", L'Aérophile, October 1, 1913, pp. 447-448). The source of information used by Root was an extensive article in the Independent (Henry Woodhouse, "Safety and Stability in the Aeroplane of Today", The Independent, October 23, 1913, pp. 166-168). 2) The next topic is about airboats (flying boats) and hydroplanes (floatplanes) and starts with quoting the closing paragraph of the same article in the Independent that talks about two pilots who flew from Chicago to Detroit, 900 miles, which they covered in 900 minutes. Such a race was advertised in the summer of 1913 as can be seen in the newspaper article "Leaders Are Off Again in World's Greatest Aeroboat Race; 900 Miles by Water and Air, From Chicago to Detroit for Prize of $17,500" (The Seattle Star, July 12, 1913, p. 6). The text in the Independent ends with the remark according to which the four principal aeroplane constructors  the Wrights, of Dayton, Ohio; Curtiss, of Hammondsport, New York; Burgess, of Marblehead, Massachusetts, and Benoist, of St. Louis, Missouri, were all developing water aeroplanes. The Wright factory was really trying to make and sell planes that took off from the water as can be seen in an interview given by the superintendent of the company, Grover Cleveland Loening, and reproduced by the Sun ("New Aeroboat to Go 67 Miles in an Hour. Stability and Speed Combined in Orville Wright's Latest Invention. ", The Sun, New York, August 11, 1913, col. 6, p. 2). At the time the article appeared, Orville's firm was already prepared to sell a hydroplane named C-H which, using only a 60 HP motor, had carried up to four people, according to Loening. The text is illustrated with the picture of a Wright floatplane resting on water. The term aeroboat does not really refer to a flying boat in the modern sense of the word. A different article ("Final Tests of New Wright Aeroboat. Success Crowns Trials. ", Dayton Daily News, November 23, 1913) shows three pictures with a new model that was a real flying boat. The essays took place on Saturday, November 22, 1913. The craft was flown by Orville Wright and Oscar Brindley. The text mentions a few technical characteristics: speed  one mile a minute, total weight in flight  almost 1800 pounds, lifting capacity  over 600 pounds, engine  6 cylinders and almost 70 HP. It is also mentioned that the aeroboat was designed by Grover C. Loening of New York under the direction of Orville Wright, and was entirely built at the Dayton factory. Also Amos Root acknowledged he was not prepared to say exactly who should have the credit for the water aeroplane, he was inclined to think the Wrights were the first in the world to experiment with hydro-aeroplanes. Definitely, he was wrong. In one of his own older articles (A. I. Root, "Flying Through the Air, Skimming Over the Water, Etc. ", Gleanings, May 15, 1907, p. 720) which quotes a text from a Dayton newspaper ("Wright Boys Score Another Triumph", Dayton Journal, March 21, 1907), the following paragraph can be found: "This is not the first hydroplane that has been invented, although never before has such a craft been seen in local waters, or ever been devised by any one in this section of the country.". In conclusion, the journalists were well aware in March 1907, when the Wrights performed experiments with a machine (without wings) that floated on water and was pushed by two counter-rotating aerial propellers, that such an apparatus was not their invention. 3) The third and the last matter, in Root's January 15, 1914, text, is about the single propeller aeroplane of Orville, baptized model "E" and tested by the inventor himself on October 6, 1913. The apparatus was made especially for exhibition purposes. According to the Cleveland Plain Dealer, quoted by the old Amos, "in a test against time a flight was made, and the entire machine dismantled and loaded ready for shipment in twelve minutes". 4) One month later, the same aviation enthusiast came with another article ("Flying To Be Made Safer in the Near Future", Gleanings, February 15, 1914, p. 159-160). His source of information was the Cleveland Plain Dealer which extensively quoted some affirmations of Orville made before January 5, 1914. The text is about an automatic stabilizer invented by the two brothers about which the one still alive claimed that it was more accurate than any aviator could be and would make flying fool proof. He also said he had flown many miles with it and had never touched the controls. The Cincinnati Enquirer ("Wizard Orville Wright Demonstrates "Fool-Proof" Aerial Device, Which Is Expected To Revolutionize Present Methods of Warfare", The Cincinnati Enquirer, January 4, 1914, p. 1) quotes the same statements of Orville presenting them as a special dispatch from Dayton dated January 3, 1914. In reality, an autopilot based on the pendulum principle is fundamentally flawed because the pendulum aligns to the vertical, after finishing its damped oscillations, just in a few particular situations like the ones in which the suspension point is at rest or moves at a constant speed as a vector. This is not the case inside a plane. A technical drawing of the Wright stabilizer is available in L'Aérophile (P. James, "Le Stabilisateur Automatique Wright", L'Aérophile, February 1, 1914, p. 59). The pendulum supposed to efficiently control the roll stability can be clearly seen in the image. Using various pretexts, A. I. Root continued to refresh the memory of his readers with the story according to which he had seen the Wright brothers flying in 1904. No less than four such articles can be found between February 15, 1914, and September 15, 1915. 1) "Dasheen, Flying-Machines, and Something About God's New and Wonderful Gifts to Us in 1914" (Gleanings, February 15, 1914, p. 160) contains a text dedicated to an air passenger service, between St. Petersburg and Tampa, Florida, that used the flying boats of Tom W. Benoist, one of the leading aircraft manufacturers in the United States. As an introduction for such an achievement that ten years before, in 1904, was just a dream, the old Amos reminded the buyers of his journal that the world laughed when he told what he had seen after visiting the Wright brothers. Again, he is vague and does not explicitly say what exactly he witnessed. 2) Nine months later, in "Our Homes" (Gleanings, November 15, 1914, pp. 913-916 (p. 915)), the old beekeeper, one more time, wrote something about the two inventors stating that "The Wright brothers could not have invented their flying-machine without gasoline". As a parenthesis, on October 7, 1906, the Romanian aviation pioneer Traian Vuia flew 4 meters at a height of about 15 cm in a single tractor monoplane powered by a steam engine that used carbonic acid instead of water. This was a public test controlled by Ernest Archdeacon and Édouard Surcouf, members of the French aero club (Auguste Nicolleau, "L'Aéroplane Vuia", L'Aérophile, October 1906, pp. 242-243). Wilbur Wright was first seen flying, beyond any doubt, on August 8, 1908. If the gasoline motor had not existed the aviation based on steam engines would have been possible. 3) In "The Flying-Machine  A New Use For It." (Gleanings, August 1, 1915, p. 649) A. I. Root, visibly marked by the First World War, recalled an episode that happened when he was having such an enjoyable time in being with the Wrights when they made their first experiments (as a remark, the word "experiments" is used, not "flights"). His enjoyment was greatly marred on being informed by Wilbur Wright that the flying machine would probably be of more use in war than as a vehicle to assist commerce and travel. The old businessman and aviation enthusiast presents what the elder of the two brothers told him as a personal original prediction of this inventor, something that he saw fulfilled before his eyes, in 1915. In reality, the potential of heavier than air flying machines as weapons was envisioned by many others before. The French war office even financed the engineer Clément Ader to build a plane for military purposes. On October 14, 1897, Ader's aircraft was seriously damaged while attempting a take off in front of an official military commission. The apparatus never left the ground. Therefore, there was nothing new in that prophecy of Wilbur. 4) One month and a half later (Gleanings, September 15, 1915, p. 782) Root advertised a book titled "The Story of Art Smith" about an American aviator. As expected, he did not miss the opportunity to remind his subscribers he was with the Wright brothers when they made their first flight that succeeded in bringing the machine back to the place of starting. This businessman from Medina, Ohio, really believed that if he repeated the same lie often enough his January 1, 1905, tale would become an accepted truth. Orville Wright Sells Interests in Wright Aero-plane Company. New York, Oct. 13. 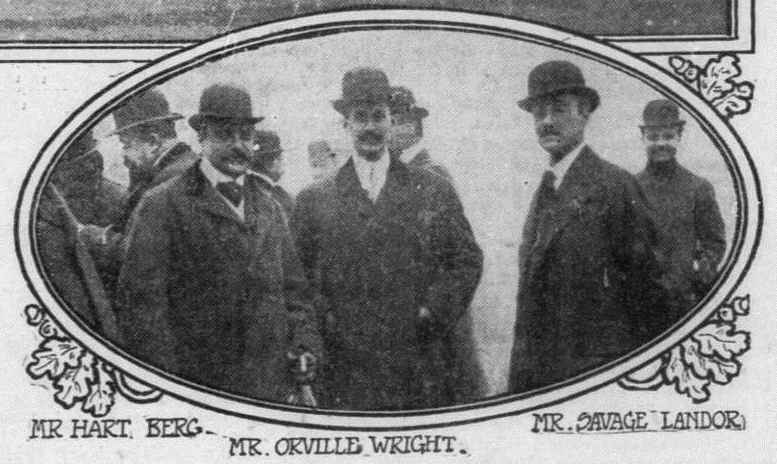  Orville Wright has sold his entire interest in the Wright Aeroplane Company, at Dayton, O., to a syndicate consisting of William B. Thompson, Albert H. Wiggin, president of the Case National Bank of New York, and T. Frank Manville, of the H. W. Johns-Manville Company, according to an announcement made here today. All negotiations for the purchase of the Wright company have been completed in New York and the stock will be transferred within a day or two. Dayton, O., Oct. 13.  The sale of the Wright aeroplane factory was for a consideration of approximately $1,500,000, it was reported here today. "The sale includes everything," he said, "I shall retain some stock in the company and probably will be consulted in an advisory capacity. I will give my time to scientific research along the lines of aviation. I think I shall enjoy the respite from business cares." Root was unsure about the real reasons which determined the younger of the two brothers to sell his company but he speculated that Orville might have done it because he was averse to furnishing machines for war. The old apiarist and entrepreneur was definitely wrong. The telegram sent by Brigadier General James Allen to the Wrights, on February 8, 1908, informing them their bid, to deliver a plane to the US War Department for $25,000, had been accepted, is evidence the two inventors did not care too much their machines would be used for military purposes and killing people. At this point, it is worth mentioning a letter, the last one that can be found, sent by A. I. Root to the Wrights, on September 14, 1915. The old Amos started his text by recommending that Orville read "The Story of Art Smith". He even sent a clipping from Gleanings with the article where he advertised the book. It is clear from the content of the letter he had not been in touch with the Wrights for a long time because he wrote: "I suppose your good father is still alive as I have heard nothing to the contrary and I trust your bright and able sister is still living to see the success of her brother's work.". From the same text, we learn that Root had not found, in the newspapers, too much information about the company of Orville. However, he knew that it was quoted at a million Dollars or over and he reminded his younger friend that he once said their invention would be worth a Million Dollars. He was glad to see his prediction, so far, verified. The letter is unfocused. It might appear that the old beekeeper just intended to find out new things regarding Orville's factory and publish something about it because he explained that Wilbur once said to him that he might write up whatever he saw, providing he told the truth, and he presumed Wilbur had meant nothing but the truth. This affirmation can be interpreted as an assurance that, in case he had received news from Orville he would not have written in Gleanings things not approved by him. The next article ("Aeroplane Development", Gleanings, April 15, 1916, p. 335), where the two inventors are mentioned, is about the contribution World War I had in revolutionising the aeroplane or at least this was the opinion of the old Amos who, at the same time, felt the need to stress the idea according to which there had been no radical departures from the early models of Orville and Wilbur Wright, although there existed, at that time (1916) many varied arrangements of the wings. In reality, the planes used during the First World War were most of them single tractor biplanes, quite different from the double pusher apparatus with a front elevator flown by Wilbur in France, on August 8, 1908. Using Root's way of reasoning one can arrive quickly at the conclusion that a WWII Messerschmitt 262 did not depart too much from the first planes of the two brothers. An article in Collier's ("The Title to an Honor", Collier's, January 6, 1917, p. 11) attacking all those who had made efforts to rob the Wrights of their hard-earned title to being the originators of the art of flying, as A. I. Root persisted in claiming, determined this businessman from Medina to reproduce its integral text in his journal ("Wilbur and Orville Wright", Gleanings, April 1917, pp. 300-301). According to Collier's, that is vague and does not give names, a group of men took out of the Smithsonian Institution the old Langley machine which had been wrecked in launching, operated numerous modifications on it, added a number of devices that were the inventions of the Wrights and finally succeeded in making the apparatus not fly but hop. A 1914 newspaper article ("Langley Folly Flies", The Alma Record, Alma, Michigan, US, June 4, 1914, col. 3, p. 3) partly confirms the version of Collier's, stating that at the request of Secretary Charles D. Walcott of the Smithsonian institution, Glenn H. Curtiss (an enemy of the Wrights) had Langley's machine sent to his factory at Hammondsport, N. Y. where it was fitted with pontoons, the wings were covered again, and the engine was tuned. The apparatus demonstrated the ability to raise itself from the water. According to Curtiss, the machine demonstrated that the principles embodied in its construction were correct. As a remark, Orville, quoted in the same 1914 article, did not accuse Curtiss of adding devices created by his brother and him. He simply affirmed that there was nothing in common between the two machines, Langley's system of control being entirely different from that of the Wright machines and then he stressed that Langley's plane was tried out ten days before Wrights' successful flight in 1903 and failed. Unfortunately, while Samuel Langley's lack of success on December 8, 1903, was witnessed by a numerous public, the December 17, 1903, flights of the two Daytonians still rest completely shrouded in mystery like all their powered flights performed before August 8, 1908. In consequence, the closing paragraph in Collier's, according to which "the Wright brothers were the first persons to leave the earth in a mechanically propelled plane", remains just a pure belief based on trusting the word of the two inventors, more precisely a telegram sent by Orville to his father, on December 17, 1903, and a letter with clarifications addressed to the press (see: "Wright Flyer. A Report of Late Tests Is Given by Messrs. Wright, Inventors of the Machine. Interesting Description of the Trials Made at Kitty Hawk. ", Dayton Press, Ohio, US, January 6, 1904), both of them containing simple claims. There is no word about witnesses and no picture or technical drawing of the plane is present. More, an obvious misleading statement can be detected by comparing the text of the telegram (where with the words "inform Press" Milton Wright was clearly instructed to make public the success of his sons) and the January 6, 1904, explanatory article in which the brothers talk about the contents of a private telegram, announcing to their folks at home the success of their trials, that was dishonestly communicated to newspaper men at the Norfolk office. They also say, in the same newspaper column, that it had not been their intention to make any detailed public statement concerning the private trails of their power "Flyer" on the 17th of December 1904. As can be seen, the Wrights fail to make clear that the intended final beneficiary of the telegram was the American public, at least the inhabitants of Dayton. As it is formulated, the January 6, 1904, article misleads the readers making them to believe that a message, not destined for a large audience at all, reached some dishonest newspaper men, was distorted and finally a fictitious story incorrect in almost every detail was very widely disseminated (see: "Flying Machine Soars 3 Miles in Teeth of High Wind Over Sand Hills and Waves at Kitty Hawk on Carolina Coast", Virginian-Pilot, US, December 18, 1903, p. 1). In reality, there is no solid evidence a licked telegram was the source of inspiration for the fanciful account, in the Virginian-Pilot, which spread like wildfire. It must be stressed that not all the daily papers got the story wrong. There are articles like "Dayton Boys Solve Problem" (Dayton Herald, Ohio, US, December 18, 1903) or "Dayton Boys Emulate Great Santos-Dumont" (Dayton Daily News, Ohio, US, December 18, 1903) which reproduced the telegram, just with minor changes to make it more readable, without distorting its contents in any way. It seems ridiculous, but the most serious evidence, behind the December 17, 1903, powered flights, consists of a short text cabled to Dayton and a letter, of the two brothers, with further explanations. Both documents were published immediately. Coming back to the April 1917 text in Gleanings, a more hidden goal can be detected behind it. A. I. Root used the pro Wrights article in Collier's as a pretext to repeat once again he was with the Wright Brothers when they made their first success in getting the machine to turn around and come back to the starting-place. It should also be remarked that this is a rare case in which the old apiarist, entrepreneur and aviation enthusiast indicates precisely the page and issue of his journal where the story, that made the world aware of what he had seen, can be found. These are his exact words: "GLEANINGS was privileged to give the first account, by an eye witness, of their invention of any magazine or periodical in the world. See GLEANINGS for January 1, 1905, p. 32." Also of little relevance, it is the right moment now to mention a letter dated August 18, 1917, and addressed by Orville to the A. I. Root Company. It contains just an order for a quantity of wax, "Gentlemen: Kindly send me by Parcels Post ten pounds of beeswax.". The next letter in line, marked April 15, 1918, was written by H. H. Root (one of the old Amos' sons) to O. Wright as a means to express his regret he was not at home when Orville came. Its content is significant to a certain extent because H. H. Root stated somewhere inside the text: "all of us appreciate your kindness to father in those early days when you were making those first, wonderful, revolutionary experiments". As a remark, he did not use the word "flights" preferring to say "experiments" which is a vague term. There is no doubt the Wrights performed some tests in 1904 but this does not mean they flew a man carrying powered plane that year. Another thing of some value is the affirmation of H. H. Root that his father treasured every reference to Orville (the Wrights) that he saw in the newspapers, and he had watched their work with what was almost a fatherly interest.". This is correct as long as the old Amos often published in his periodical various updates about the two brothers, but it is also equally true he did it to emphasise he was the first witness of a real life plane that had even flown in a circuit since the world began, a fraudulent claim. "Aviation and Stimulants" plus "Saloon and the "Chicken Business"" (Gleanings, February 1919, pp. 110-112), an article composed of two parts, is the next text connected to the Wrights and at the same time one of the most important because it contains Root's memories about his direct interaction with the two inventors, in 1904. A few lines in the Sunday School Times, for October 3, 1918, that made reference to a widely circulated opinion against the use of alcohol in flying expressed by one of the brothers, recalled in Root's mind a number of incidents, that had happened in 1904, which he condensed in a few paragraphs permitting to all those interested in identifying the truth, in the intricate Wright affair, to have a relatively clear picture of what really this businessman from Medina witnessed. Amos Root recalls that at one point he had an intimation that the Wright brothers were experimenting with a flying machine ("Our Homes", Gleanings, March 1, 1904, pp. 240-243 (p. 241)). Then he felt as if he could not rest unless he went down to Dayton to see the brothers' work. This state of exaggerated impatience can be traced in his letters sent between February 16 and July 26, 1904. After months of persistent insistence, he received the green light and started on his trip with an automobile. He found the Wrights on the very same aviation grounds, still in existence at the time the article was published or the day the text was written (October 19, 1918), a few miles east of the city of Dayton. He obtained board and lodging at a farmhouse near by which was kept by a renter by the name of Beard. All these happened during that eventful summer (of 1904). Root remained for a few days with the Beard family and during the nights and mornings, before the Wright brothers got around, he became quite well acquainted with Mrs. Beard, an invalid suffering from lung trouble. Before the winter's snow came on, Orville Wright wrote A. I. Root that his good friend Mrs. Beard had died of "quick consumption". Regarding the tests of the two inventors, the old aviation enthusiast declares that at first he was somewhat worried for fear the brothers would not care to have a spectator hanging around, and maybe meddling while they experimented with an apparatus that might mean death instead of success in navigating the air like a bird. Root also noticed the neighbors seemed to take no particular interest in the experiments and him and the Wrights were, most of the time, a good deal alone, and they soon became fairly well acquainted with each other. At one point the brothers insisted that their new friend should go home with them and get acquainted with their sister Katharine. "We do use coffee to some extent ordinarily; but today we expect to make one or more flights; and when we are going to handle that flying machine we want every bit of strength of mind and body to enable us to do just the right thing at just the right time; and we have learned by experience that a cup of coffee is a detriment and a hindrance; therefore no coffee in the morning when we expect to make flights during the day." As can be seen, also the word "flights" appears in the text, the old beekeeper missed again the opportunity to mention he had witnessed at least one. The last piece of information, that is worth some attention, is the affirmation made by the old Amos according to which Katharine, who was at the time a school-teacher, had helped more or less in financing the boys in their novel undertaking. No further explanations are provided. In "Our Homes" (Gleanings, June 1919, pp. 392-394) Root reminded again his readers he had a granddaughter Catharine named after the sister of the Wright brothers and then he reproduced a passage from the Hummer, a little periodical of which Howard Calvert, his grandson, was the editor. Writing about his grandfather, who at that time was quite enthusiastic about his electric automobile charged by a windmill, H. Calvert considered that the success of A. I. Root's prophecy regarding wind power would be assured in years to come in much the same way as the success of the Wright Brothers' airplanes, predicted by his grandfather several years before aviation was perfected, had already become reality. As a remark, H. Calvert does not really say Amos Root witnessed the two Daytonians flying in 1904. He just wrote his grandfather had made some predictions regarding the future of aviation and his prophecies materialized a few years later. The same issue of Gleanings contains an article about a record flight made by Maj. T. C. MacAuley who flew from San Diego, California, to Jacksonville, Florida, in 19 hours and 15 minutes, total time in the air ("From San Diego, Cal., to Jacksonville, Fla., in 19 Hours and 15 Minutes." (Gleanings, June 1919, pp. 394-395). It has to be mentioned that this was not a continuous flight, but the old apiarist realised that, in theory, it would have been possible for one to get an early breakfast in San Diego and a late supper in Jacksonville all in one and the same day. I have mentioned one or more times that it was my great privilege to be with the Wright brothers when they first made their flying machine start out and turn around and come back to the starting place. when the Wright brothers first made that wonderful flight and whirled around and came back to the place of starting, he said that the feat would some time be recorded side by side with that of Columbus when he discovered America. The next article of interest is "Our Florida Garden and Some Glimpses of Our Florida Home" (Gleanings, August 1919, pp. 538-540) where, one more time, Root refers to his January 1, 1905, tale, while explaining that beside him, in a picture, was Huber's (one of his sons) daughter, Katharine who was named after the sister of the Wright brothers who invented the flying machine. He further explains that Miss Katharyn Root was born shortly after the Wright brothers made their first successful flight and got back to the starting place, stressing that an account of that event was first written up (and first given to the world) in Gleanings in 1905. Huber's daughter was not born so shortly after that flight in circuit of Wilbur, allegedly witnessed by her grandfather, but much later at a time when the two inventors and their sister were already known in the entire world and their celebrity of 1909 was the real reason Root's granddaughter was named after Katherine Wright not the fantastic event of September 20, 1904. "Away Up High, Papa's Baby" (Gleanings, October 1919, pp. 679-682 (p. 680)), the next article where the two Daytonians are mentioned, is of particular importance because it tells us that the old businessman finally flew, during the 1919 county fair organized in Medina, and had the opportunity to see his town from above. A. I. Root gives an extensive and realistic description of the flight, specific to people who share their impressions with others after travelling through the air for the first time. Inasmuch as I was with the Wright brothers during their experiments, and witnessed their first successful flight in getting around to the startingplace, everybody took it for granted that I would be the first one to fly. It is not quite clear what he meant by "everybody" but it is self-evident Amos Root attempted again to strengthen his claim he had witnessed Wilbur flying on September 20, 1904. He first refused to get on the plane because of his advanced age but after one of his daughters, Constance Root Boyden, broke the ice and went up reaching the neighbourhood of the clouds, the old entrepreneur finally consented. He was equipped with a sort of fur-lined hood and the apparatus took off, with him as a passenger, seriously shaking him as the machine bumped over the rough meadow lot, uphill toward the north, and making him to almost regret for a short while his decision to fly. However, when all of a sudden the beautiful machine slipped up noiselessly into the air, a wonderful thrill of thanksgiving and praise came into his heart, that it was finally his privilege to go up in a flying-machine. Another column touching the subject "The Wright brothers" is "A. I. Root As His Daughter Sees Him" (Gleanings, March 1921, pp. 171), a text that simply reproduces the article "One of the Farm Journal's Oldest Friends, Amos I. Root, the Bee Man" which appeared in the Farm Journal for January 1921 and was written by his daughter, Constance Boyden, the one who flew in 1919 and encouraged his father to do the same. He was one of the first keenly interested in aviation, being a confidant and friend of the Wright Brothers when they were making their first secret attempts at flying. As can be remarked, the text does not explicitly say Amos Root witnessed the Wrights flying in 1904. The daughter of this entrepreneur just says her father was a confidant of the two inventors at the time they were making their first secret attempts at flying. Confidant does not automatically mean eyewitness and attempts at flying is not necessarily the equivalent of manned powered flights. As it is formulated, Constance Boyden's sentence is just a carefully worded message susceptible to various interpretations. In "Flying-machines Versus Horses, Trucks, Railways or Steamboats" (Gleanings, June 1922, pp. 402-403), another text that contains the name of the two inventors, A. I. Root comes back to his old idea according to which the cheapest way to move freight of any sort is by the "AIR" route. This thought reappeared in his mind while watching the activity of some energetic Italian bees returning full of pollen to their hive. He did not have precise figures but believing the bees had been demonstrating for ages past the superiority of the "air route" over anything else for moving things and also thinking he was the first to ask himself such a question, Root proposed anybody, who might have been interested in the subject, to do the math and calculate what proportion the honey and pollen bear to the weight of the bee that carries them. More than 110 years of aviation, measured from 1906 when the first took offs were officially witnessed, show that the air route is inefficient for carrying freight and trucks, trains and ships still reign when it comes to moving heavy loads. When Wilber Wright made his first trip out into the great free air and back again with his flying-machine, I told him that he had that day demonstrated the possibility of travel without macadamized roads or railways. As a note, even before September 20, 1904, in a long text, published in Gleanings for September 1, 1904, that made no explicit reference to the Wrights and their invention, Root wrote: "I am not at liberty just now to tell all I know in regard to this matter", the matter being that "people were already, at least to some extent, ignoring roads of every kind, and climbing through the air, and not by means of the gas-balloon". Definitely, the old entrepreneur already had in mind the possibility of travel without macadamized roads or railways without seeing Wilbur flying because this man from Medina often repeated he had just witnessed some tests performed by the Wrights, in the summer of 1904, avoiding to say he had seen them flying. Coming back to the June 1922 article, it is worth mentioning that, talking about his early hobbies in life, windmills and electricity, A. I. Root states at one point that it did get into his head that the two could be linked together, when he was near 80 years old which is another example of ignorance and self-importance displayed by him. In reality, powerful wind turbines that generated electricity and charged batteries had been built since the time Root was about 50. An example is the electric generator of Charles F. Brush of Cleveland, Ohio ("Mr. Brush Windmill Dynamo", Scientific American, December 20, 1890, cover and p. 389) that, at the time the article was printed, had been in continuous operation for more than two years. It was capable of generating up to 12 kW and a big batterie composed of 408 secondary cells occupied a room in the basement of Brush's house. The last article of interest in Gleanings ("Modern Surgery: What it Has Accomplished. ", Gleanings, December 1922, pp. 802-803) brings nothing new. A. I. Root just repeats that he suggested naming Huber's daughter (born on June 20, 1909) after the good sister of the Wright brothers, with whom he was in touch, some years before. On April 30, 1923, Ernest, A. I. Root's oldest son, informed Orville that his father had passed away that day. O. Wright replied on May 8, 1923, and his answer was rather formal. He wrote things that are usually said when somebody dies, but he also tried to accredit the idea that Amos Root had seen the Wrights flying in 1904 because he referred to the visits of Ernest's father at the time when he and his brother were carrying on their early flying experiments. The text does not clearly state A. I. Root witnessed flights in 1904. It just talks about "flying experiments" performed at the time this aviation enthusiast used to visit the two Daytonians. In an answer that followed about one week later, on May 16, 1923, Ernest Root affirmed that his father had often spoken about the Wrights and had seemed to feel a great deal of pride in that he had known them personally. 1) On December 19, 1930, E. R. Root started his letter to Orville by saying that he had read with very much interest the true story of the Wright Brothers which he assumed to be authentic. He also appreciated very much the reference to A. I. Root. Wilbur flew a full circle with a circumference of 4080 feet in 2 minutes 15 2/5 seconds. A. I. Root, editor of a bee journal, was present.". However, Ernest R. R. had some doubts regarding the credibility of McMahon's story otherwise he would not have said: "which I assumed to be authentic". 2) In three letters, E. R. Root denied any involvement of Root's family members in spreading the false information according to which his father had financed the Wrights, helping them to develop the machine. Orville assured him that neither he nor his brother had ever believed that his father had been responsible for those incorrect reports. 3) Two of the letters express the regret of Ernest R. R., who spoke in the name of the entire Root family, that they missed the opportunity to meet Orville when he came to Medina in the spring of 1918 (see: H. H. Root, "Letter to Orville Wright", April 15, 1918). 4) The letter of January 3, 1933, is of greater importance in comparison to the others because its main subject is about another letter E. R. Root sent, in December 1932, to a certain Jay Smith who wrote for magazines and had demanded two copies of Gleanings (January 1905) that had pictures of the Wright Brothers' flying machine. Together with Ernest's letter, Orville also got a copy of the text addressed to J. Smith who, unfortunately, did not receive what he had asked for but a copy of the January 1, 1905, issue of Gleanings which contained (see: "My Flying-Machine Story", January 1, 1905, Gleanings, p. 48) just a fraudulent promise that a picture of the flying machine would appear in the January 15, 1905, number of the same journal. The oldest son of Amos Root tried, in his December 2, 1932, answer, to make J. Smith believe that such a picture existed saying that he remembered it very distinctly but he could not locate it. In reality, only the photo of a glider was printed (see: "The Wright Brothers' Flying-Machine", January 15, 1905, Gleanings, pp. 86-87) and E. R. Root knew this or at least had all the information to locate the article. Had he been an honest man he would have told Jay Smith that no picture with a Wright plane was published in Gleanings before August 8, 1908. 5) Together with his January 3, 1933, letter, E. R. Root sent Orville a copy of Gleanings for January 1st, 1905, saying that, based on his father's reports, he had prepared an article for the Scientific American about the work of the Wrights. Unfortunately, his text was turned down. Orville (who evidently had in front of him the February 4, 1905, letter of A. I. Root where the old aviation enthusiast wrote he had sent marked copies to the Sci. Am.) asked in his reply, that came on January 31, 1933, whether a marked copy of the January 1, 1905, article had been mailed to the Scientific American or something else. E. R. Root answered he had sent a paper prepared by him and signed by his father, which was a different text from that of A. I. Root. If his memory is right, also the Scientific American might have received a marked copy of Gleanings (the second sent by Amos Root) it also got a manuscript of Ernest, describing Wrights' first flights and having an unknown precise content, which was rejected. 6) The last thing of interest, that can be found in the 1930 - 1935 correspondence, is a reference to letters that were written by Wilbur or Orville to A. I. Root (see: E. R. Root, "Letter to Orville Wright", December 31, 1935). Regarding these documents, there also exists a note on a page, with a printed header reading "From the desk of Orville Wright", which mentions a December 1938 letter sent by a certain Mrs. A. E. Mc Laudon who offered for sale letters of W. Bros. to Root. Another relevant document is a text dated November 5, 1943. It is written by somebody from the A. I. Root Company who informed Fred C. Kelly (a biographer of the two Daytonians) that if he really wanted those letters, a trip to Florida was necessary to talk with a woman who had them, and make copies. No further information is available regarding the fate of Wrights' letters to Amos Root. For the continuation of the text download the entire book.